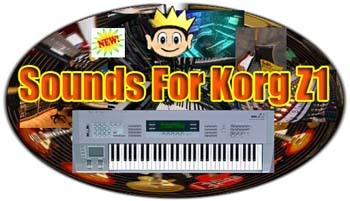 Back in the 90’s, one of the few Korg synthesizers that Kid Nepro missed programming sounds for was the Korg Z1. Well the kid was a bit late, but he has recently picked up an old Z1 and have finally gotten around to making a sound library for this cool Korg synth. Now available are two new sound collections. Each containing 128 new programs. Volume 1 – Classic Synths ($35. USD) contains 128 new programs. A mixed bag of sounds that ranges from classic analog synth textures to soundtrack and film special effects with a bunch of funky rhythmic textures thrown in. Classic Synths has a great deal of rhythmic “grooves” and “riffs”. These patterns can be the starting point that you can use to create your next track. We split the rhythmic sounds and sustained sounds in half. There are 64 rhythmic textures and then 64 sustained sounds. Volume 2 – Physical Modeling Mix ($35. USD) also includes 128 programs. For most patches the arpeggiator was turned off and we concentrated on sustained sounds. There are several physical model instruments such as Reeds (clarinet, flute, sax), Organs (rock, gospel, jazz), Electric Pianos (Wurli’s and Rhodes), Acoustic Guitars (plucked) and Strings (bowed and plucked). There are also several unique synth textures and classic analog and digital synth models. A mix of synth leads, basses, pads, keys and brass. You will also find a few rhythmic patterns and special effects. Both volumes are available in sysex or midi file formats and delivered via our free download delivery.